The Thompson house at Sweet Bottom Plantation is more typical of the Charleston “Single” style home. These homes have a design that is well suited to the hot, humid local climate. The one-room-wide houses offered welcome cross-ventilation in the days before air-conditioning. They are only one-room-wide and the narrow end of the house faces the street. Two and Three-story porches, called "piazzas" in Charleston, stretch down the long side of each home. They were designed this way to catch the ocean breeze and to fit deep narrow in-town lots that were laid out when the British first laid out the town. This entry is typical of the "Single" style house as it enters onto the porch instead of the house proper. The three porches or verandas open out onto the piazza garden. Centered on the garden one finds the front doorway into the foyer. The first view of the Living Room. These portable antique bars were used in the old days for the owner of the home to transport and lock up fine liquors. This private study is located behind the formal Living Room. The original Charleston houses would have had a Drawing Room and a Withdrawing Room where people could retire to after dinner. A private bar, off of a back hallway, behind the Dining Room was included in the plan. The Family Room is located on the back of the house and looks out through its screen porch to the back yard and the Chattahoochee River. The Kitchen and Breakfast Room, which are open the Family Room, also look out onto the back yard and river. The space over the three car garage at the back of the property accommodates the Bonus/Media Room. The Downstairs Screen Porch leading out to the river. Another unique feature of a Charleston Single House is that the front door is on the end of porch! Yes, go through the front door from the street and you're on the porch, not inside the house proper. This is because the entrance hall is centered on the side of the house facing the piazza. 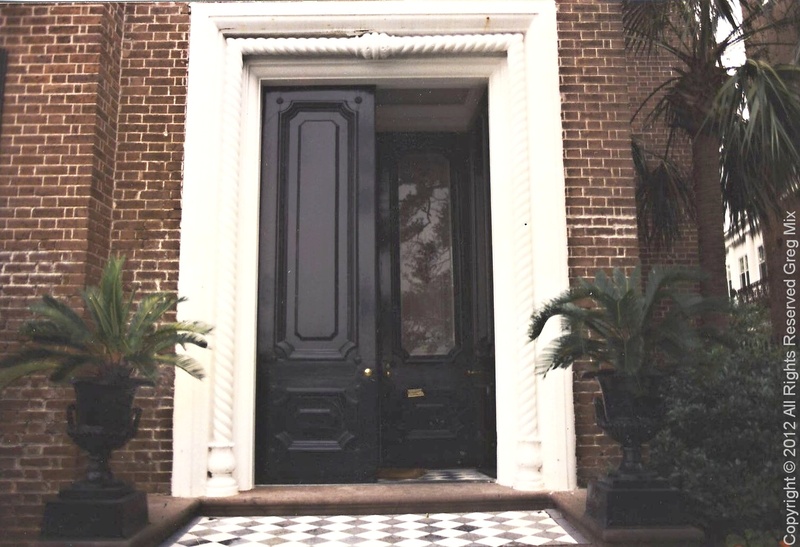 Three classical orders of columns were used on the porches. It has Doric columns on the ground level, Ionic on the second level and Corinthian capitals on the third. This is one of two Charleston style homes that Greg Mix designed in the Sweet Bottom Plantation subdivision north of Atlanta in Duluth, Georgia. The inspiration for this new home was from an old Charleston single style home at No. 9 on The Battery, right on Charleston Bay. 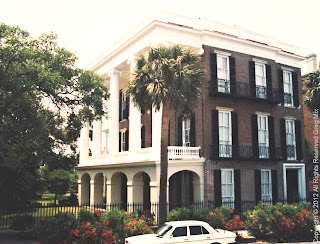 The Robert William Roper House was built about 1838 in Charleston, South Carolina by a prominent cotton planter. The house is an outstanding example of early 19th Century Greek Revival architecture, built on a monumental scale. 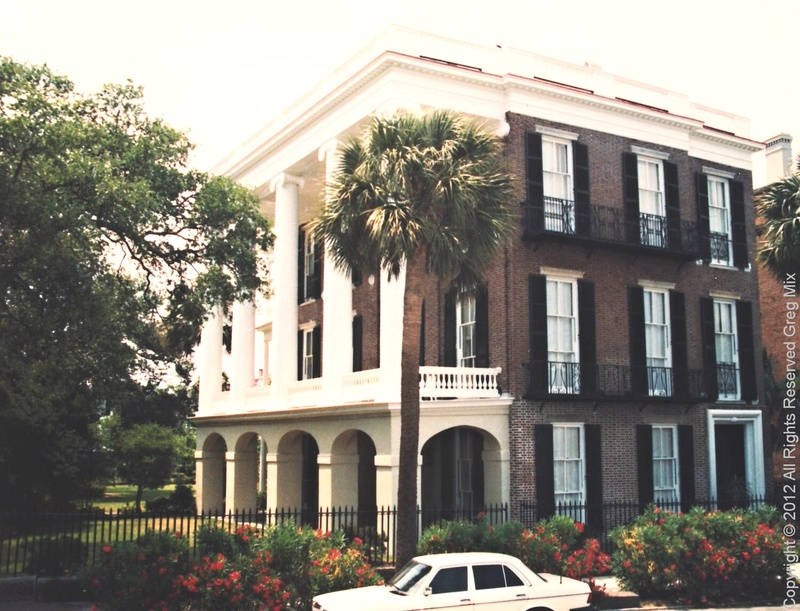 It is said that Mr. Roper intended his showcase home to be the first residence seen by visitors approaching Charleston from the sea. The house was placed on the National Register of Historic Places in 1973. In this case the plan has been flipped and laid out inside to suit the modern lifestyle. As you can see in the photos it contains a double spiral stairway. The three car garage is on the ground floor as well as the front entry, study, guest room and a pool bath which exist directly onto the pool area in the back yard. The main living areas are on the next level up or the first floor. This level includes the family room, living room, dining room, breakfast room and kitchen. The third level or second floor contains the master suite and two additional bedrooms. The current owners have furnished the house beautifully and built private Charleston style gardens to the side and rear. 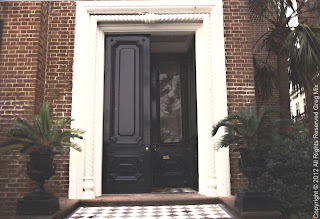 Front Entry based on original house in Charleston, S.C. The Gazebo in the square on The Battery in front of the home. This walkway provides access from the Front Entry around to the Garden Courtyard. The Pool/Guest Bath. The door to the left leads out to the pool in the backyard. The Back Hall with the Owners Hat Collection. The Front Hall with the 1790's Grandfather Clock. First Floor Level (Mid Level) Stair Landing Detail. First Floor Level (Mid Level) Bedroom. Art work and antique chest in Front Foyer.